My name is Mindy (Melynda) Downard, I am 38yrs old. My mother, Donna was diagnosed with Alzheimer's around 3 yrs ago. Shes 75. We live together and I am her caregiver. I also have a 9yr old son who i have part time and a 2yr old daughter who I have full time. I'm a single mom. I believe that falls into the sandwich category you had listed. On top of those things I run a small business. It's a salon here in Corvallis. My life is crazy and it's hard to hold it together. Even harder because I'm navigating all of this alone. I get help from one of my nieces and my oldest sister is paying monthly for that. No respite care, no time off. I'm either at work, or I'm home with my family. Let's see... as moms condition progresses she spends most of her time coloring as I mentioned on the phone with you. But I dont ever really leave her home alone so we do mostly everything together. On Thursdays and Fridays she even comes to work with me. She sweeps up after haircuts and folds towels while shes there at the salon. She cleaned houses for a living and really likes to try to keep the house work up at home as well. We've been doing gardening together this year. Bought and planted a lot of flowers. She likes to clean up outside when the weather is nice. We have 3 dogs, 2 of which are very partial to mom and she loves them. They sleep with her at night. We took my kids to the Enchanted Forest just recently. It's a yearly thing for us to go. When I go to visit friends, mom comes along. Group activities, such as 3rd of July fireworks in Newport, we brought mom. Shes a big part of everything. All my friends and clients at the shop love her. Before she was diagnosed with Alzheimer's, shopping was always a favorite thing we did and we still try to as much as possible, though she hardly ever wants anything lol. My mom was always my best friend and we've been extremely close my whole life. That part hasn't changed even though the disease is taking her away. I called her "Mom" one day and she asked "I'm your mom?" I said "yes" and she said "well, isnt that something?! That's really good because I like you, you're really nice." This project is very touching to me because I care for my two big kids. --- My parents. My mother has breast cancer and my father liver cancer. My mom has been battling cancer all of my life. --- 26 years and my father for four years. They are walking miracles. My mother loves to dance. She says dancing takes all her pains away. She loves to go to rock and roll shows and enjoys dancing to cumbia music. Disco too. Disco music is her absolute favorite. My mom loves McDonalds. Big Macs make her world go round. She’s obsessed. She enjoys sound dishes. It’s her favorite pass time at the house. She also loves watching telenovelas (soap operas). She likes the soap operas from Spain. she enjoys hanging out with her friends. She has a lot of friends and makes friends everywhere she goes. My dad is having a really hard time right now because he use to be very active. He enjoyed biking, working out and running. Now he can’t do their activities. He can only walk, but very slowly. My father and I spend a lot of time together. I try to take him out in nature as much as I can. We go to the river, walk around our neighborhood and other neighborhoods. We go to the park and out to eat. Seafood is his absolute favorite. Him and I cook a lot when we are home. The last 6 months him and I have mostly spent our time in and out of the hospital. He gets weaker each day. We are fighting to keep him strong though, and always changing his diet to be healthier and healthier. He is cookies on fruit and veggie smothies and seafood, which is great. His diet has come a long way. Hi, I'm Cynthia. I'm 60 yrs old. 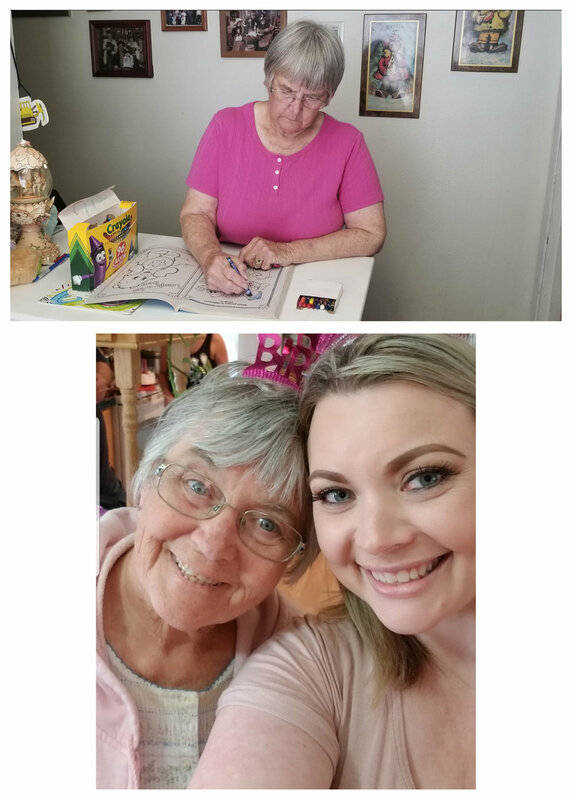 I care for my 90yr old mother who has age related health ailments and my 20 yr old daughter who is hearing and visually handicapped and suffers greatly from anxiety. I am sandwiched between daughter and mother, caregiver to both. They rely on me for transportation, medical appointments, frequent errands, grocery shopping, assisting with legal or banking needs etc. I often feel hurried, tired and stressed. I still have an upbeat attitude! And because I dearly love them, I'm grateful to be the one that stays strong for them. Nevertheless I feel frustrated and discouraged when things are not going well or when my plans are sidelined for their needs. It happens all the time. We currently don't live under one roof because my daughter attends a community college near home. My mother lives across town. However, the three of us living at my mother's house for the duration of the CARE Commercial DOC would be doable. My mother is a pianist and organist. Her life has been centered around classical music, church music and many organizations related to performing arts. In the above photo, Martha(Mom) is in her living room, surrounded by members of her church choir, rehearsing for Easter service 2018. I helped host a potluck dinner, as it was her final rehearsal. She retired from her job as church organist on Easter. Morning routine is a favorite time for Martha. She brews a large mug of Peet’s coffee. Then she walks to the mailbox for the Oregonian. 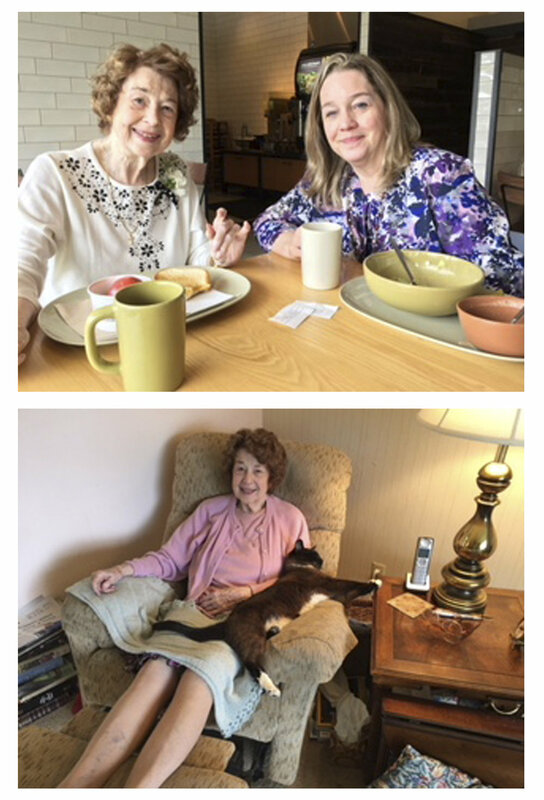 With her cat Honey Belle on her lap, Martha stretches out in her recliner and enjoys her coffee while reading the paper cover to cover. She says coffee is the secret to her longevity (plus dark chocolate). Debbie Marshall. She lives in a suburb here in Portland. She is 64 and currently taking care of her mom, my grandma Agnes, that is 94. This might seem like an easy task, but it just isn't. My grandma is like an infant. She can't do anything on her own, shower, use the bathroom, you name it. It is now my mom and dad's responsibility to care for her in every wayOk grandma Agnes didn’t work. She has never driven a car! That’s why she’s living so long... no traffic stress :) She raised 6 kids. Amazing mom and grandma. She is an awesome cook and baker. Loved to sew. We have a huge Italian family and Christmas was always the best! My grandma is kind, loving and sweet as pie! She was born is Mississippi and her mom died at a young age so she was raised by her aunt and uncle. Her first husband died in the war and they had a son together. She talks about him to this day! She met my grandpa and then moved out to Orange County where they raised their 6 kids. My mom Falls I. The middle and she is amazing! She married my dad her high school sweet heart and had four kids. I’m the oldest. They moved away from the OC up to the central coast of California. We spent our summers down in LA with family. We weee very close to my mom’s family and to grandma and grandma Rosetti. They would visit often. My mom was able to stay home and raise us like her mom did. When I was a senior, my mom went to beauty school and follwed her passion. She just recently retired. We all had a wonderful life however we had a few bumps. My moms oldest sister died of cancer and my mom’s oldest brother was murdered. Needless to say those tragedies affected our family very much especially my grandparents. When my uncle died my grandpa was never the same, he died 5 years ago. My grandma took good care of him. And as I mentioned she did pretty well on her own for many years until this year when she just became old. She turned 94 in July. My parents moved here a few months ago and grandma has been here for a month. Currently they love watching Dancing with the Stars and eating ice cream. My dad lost his parents and helps my mom with “granny” as he calls her. He was disabled from an accident work and was forced to retire at age 46. He is 63 now. They love Oregon as my brother lives here with his three adorable kids! That’s what brought my husband and I up here too. Life is too short not to be by family! Debra has a rare lung disease that requires her to be on oxygen at all times. She also has been diagnosed breast cancer. Debra has been married to her husband for 48 years. Her husband is a bit of a shy guy, but would be willing to speak on camera. She also leads support group for caregivers at the hospital. Every February she organizes a caregivers lunch to help people in the community. Their daughter is a friend of mine. Alicia (daughter) is a successful commercial and film make up artist here in Portland, Oregon. She recommended them for this. Could be fun if you hired her to do make up for this project. My husband and I have lived in the gorge for over 40 years. My family, friends, community, book groups, and floral design have all been some my hobbies. I would volunteer with the school and worked with my husband at his company. When my girls got older I opened a flower and gift shop in town. It was my joy, I loved having something I could offer the community, weather it be beautiful flowers, a gift, or a simple cup of tea. The store gave me a Independence and sense of self, a place to explore my creative side, I loved it! My health began to deteriorate and working became more difficult, I sold the store. In 2002 I was diagnosed with Pulmonary Arterial Hypertension, a very rare lung disease with a life expectancy of 2-5 years. They sent me home using oxygen at night. In 2007 a blood clot passed through my heart getting lodged in my left arm. I ended up in the operating room with a grave diagnosis. I was told to go home and get my affairs in order, they gave me 3 - 18 months. At this point I was put on full time oxygen, with a subcutaneous medical pump, not unlike the ones used for diabetes. "In 2011 I was diagnosed with Breast Cancer. Because of my PAH my options were limited. With doctors advice I got a mastectomy. My husband and caregiver, Dale, has been my consistent rock through this all. In 2002 when I first got diagnosed, he became my lifeline. He knew we could do this. In 2007 when the diagnosis became so grave he gathered our family and friends to rally around me. Dale truly became my support, when I felt like I could not take that next step forward, he always told me I could. There was nothing in Dale that believed I could not beat this diagnosis. His constant advocacy for me and my disease is pure love. The rolls in life that we had become so accustomed to were forced to change. Dale became not only my caregiver, but the caregiver to our lives. He makes my life look, a new version of normal, when the truth is he does so much behind the scenes. He helps me to bath, manage my meds, fill my oxygen bottles, all so I can be in this world and feel, my new normal. His love for me has been pure and true, always there without hesitation to help me live the best life I can. Dale has joined me in helping others with PAH through a support group that I lead for our region. It has become a passion to help others through this disease. We have an event once a year that has been very successful in raising funds for PAH research."